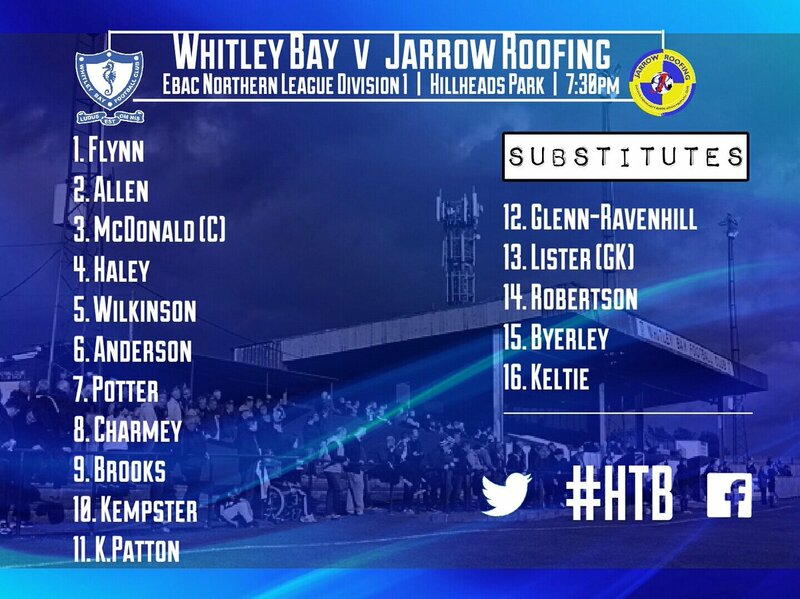 The second bus came along as expected with the visit of Jarrow for a rare Tuesday night game. There was no Boy Mark or Woodie as they were taking part in the final race of the NS Poly's Grand Prix (I can't bear to type the name in this blog) so at the start of the game it was just me and Mr Twitter standing behind the goal at the Car Park End. Bob eventually joined us to make quite a crowd - after all 3 is a crowd! There was relief for Charmey when he passed a late fitness test on his nose: damaged in the service to his country. His coming together with the Allotment End's pitch-side barrier when kissing my Allez-le-Bay Tricolore had not kept him out of the big game. We were soon rewarded for our journey out as Liam Brookes was playing like a possessed man who could play really good football. The Brookster was leaping, heading, kicking and all that sort of stuff at the right time and....his passes, headers and shots all went where he wanted them, mostly. Seven minutes in, the man-mountain or tree, since he's quite tall and thin, planted a shot past Jarrow's Top Brass in the visiting goal. The tall wonder then proceeded to terrorise the visitors with shots, headers and controls that had them tangled all ends up. However the score remained 1-0. The lads were to rue these missed chances as the unthinkable happened...Chow managed to score from outside of the six-yard box! Unfortunately the Chowster was playing for Jarrow, in a deeper midfield / defence / goalkeeper position, and it was a screaming 35-yarder that left Flynn with no chance. This must have annoyed former Bay electrical wizard, Lee Kerr, who had also signed for the Roofers. The Bald Eagle (...or is he more a Bald Badger?) unleashed another cracking strike from distance (though not quite from 35 yards out) which left an out-of-position Flynn with no chance. After their great start the Bay were behind! The whole of the first half had been accompanied by the sound of the Roofing's management duo who, like a combination of Mourinho and Klopp, constantly bawled their instructions to their team. Despite the fact that their team were 2-1 up and playing well, the pair didn't let up. At half time, the visitors headed for their dressing room fully deserving their lead. In the second half, this was all turned on its head as the Bay, once again started strongly. Brooksy had been replaced by Robbo and now it was the Bay's powerhouse who was unsettling the visiting defence. Soon after the restart, the Bay were level. Super-Charmey, with a nose for goal, unleashed a fearsome half-volley that cracked off the post and with the Brass Monkey frozen to the spot, Kyle slotted home. The game then swang from end to end with Robbo shooting wide, Jarrow's Dennis Knight, appearing not to be wearing shining armour, hit Flynn's post. In the end, a 2-2 draw was a fair result, but the excitement in the second half had most certainly been worth it. Even Bob enjoyed it. High praise indeed!